Why Are There So Many Cats on the Streets of Istanbul? In my last photoessay on Turkey’s biggest city, I wistfully recalled my many hours of wandering the cobblestone streets of Istanbul, my camera and imagination in tow. Everywhere I walked, there were cats. 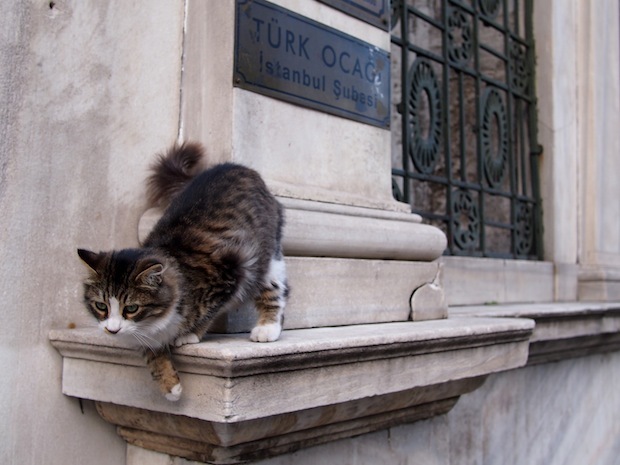 After weeks in the city I wanted to know: why are there so many cats in Istanbul? I should note that I’m a cat person. Am I cat-whisperer? Maybe not insofar as career choices go, but I do seem to be perpetually followed by cats. 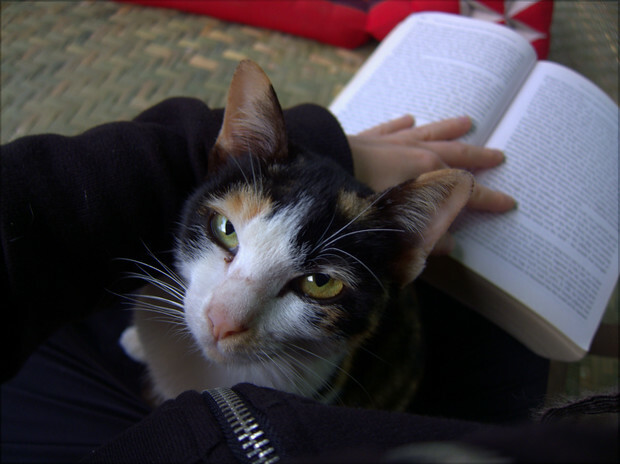 In Muang Ngoi, Laos, I would sit down to read on my bungalow’s porch and within minutes, a cat would deftly squeeze between book and knees. Daily, I’d wander to town for dinner and sit on a mat for some food. Seconds later, a feline (sometimes two) would push their way onto my lap, purring furiously. Wandering through Amman, I found myself stooping down to pet scraggly-looking cats, each materializing when I would stop to gather my bearings. As if reading Robert Fisk weren’t cumbersome enough without a cat on your lap? One of many cats in Laos. In Istanbul, my cat-magnetism (catnetism?) reached higher levels. Walking outside my guesthouse, I was flanked by felines, to the amusement of the staff who wanted to know if I bathed in fish oil. Their suspicions deepened when I returned to my room after a day of wandering to find a cat sitting contentedly in my shower. The cat-following was out of control. The truth is, of course, that there are many cats Turkey and Istanbul was awash in cats also. Many were well-fed and clean, and almost all were affectionate. To be sure, the cats slimmed down and dirtied-up when I walked outside the busier zones of the city into the immigrant areas – parts of Fatih, for example. In those laundry-strewn, narrow streets the cats were more feral, more hungry and certainly less curious. But one constant remained: there were cats everywhere. 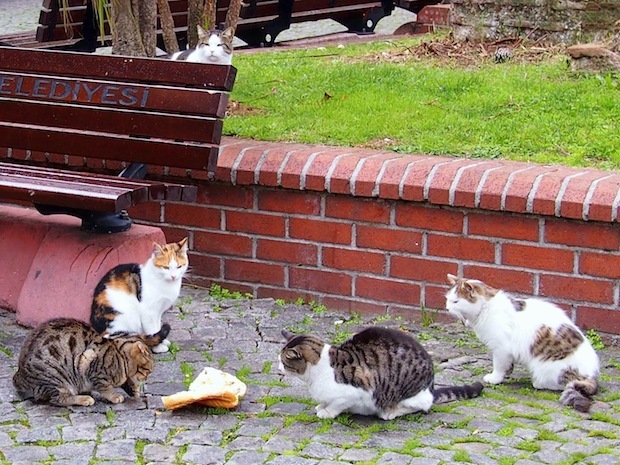 No, Seriously: Why Are There So Many Cats in Istanbul? Turkey is not unique among predominately Muslim countries for honouring its cats, which are considered ritually clean animals in Islam. In the hadith, the collected sayings and actions of Muhammad, there are numerous examples of the Prophet’s fondness for cats. By one account, Muhammad cut off his sleeve when he had to rise for prayers so as to not disturb a feline that had curled up on his robe for a nap. In another tale, the pet cat of Abu Hurayrah (literally “father of the kitten”) saved Muhammad from an attack by a deadly serpent. Muhammad purportedly blessed the cat in gratitude, giving cats the ability to always land on their feet. Cats were considered guardians in other respects for the Islamic world: they defended libraries from destruction by mice and may have helped protect city populations from rat-borne plagues. Looking through history books about Islam, many mention the prophet’s love of felines and while variations on the foregoing stories exist, the overarching affection for cats has been consistent. My usual dinner companion for the kebap cart in Sultanahmet. Park cat is pensive in Sultanahmet. Indeed, a popular saying notes “If you kill a cat, you need to build a mosque to be forgiven by God.” Wandering the streets of Istanbul you will see many small containers by the sides of buildings, and discreet food rations doled out by its inhabitants. While the cats are not adopted formally, they are taken care of by no one and everyone, a giant community network of cat caring. Even the World Basketball championships boasted a feline mascot, a blue-and-green eyed “Bascat” after the long-haired Turkish Van. 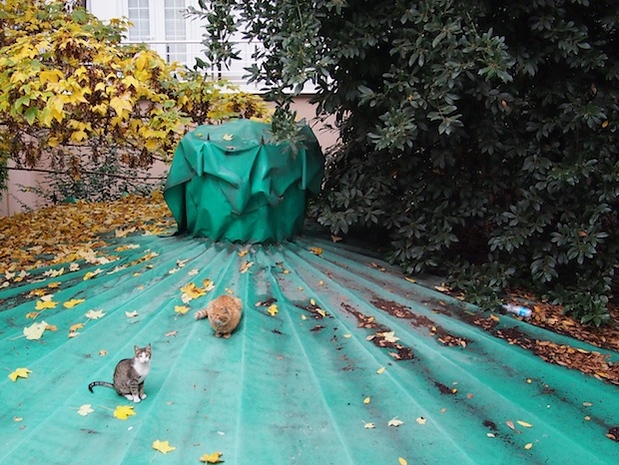 A 2016 Good Magazine Article entitled “This Winter, an Imam Is Offering Shelter to Stray Cats in Istanbul” also notes that the city is home to 30,000 stray cats. Unlike elsewhere in my travels, no one glared at me if I tried to feed then. I was the recipient of a big talking-to by a restaurant owner in Morocco; my feeding the strays would merely ensure that they returned time and time again. In contrast, when I went for chicken wings and couldn’t finish my plate, I tried to surreptitiously slip the cat underneath my chair a morsel of food. 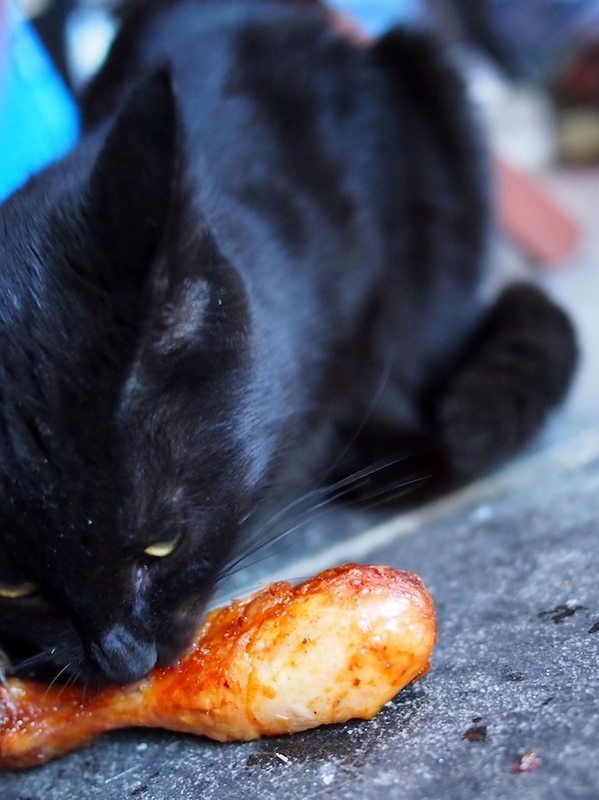 Seeing my furtiveness, the owner walked over and, a smile on his face, dropped the cat below a full drumstick to enjoy. At a chicken wing stall near the old Spice Bazaar. Of course, it’s not a purely idyllic life for the animals of Istanbul. As I already mentioned, walking the poorer parts of town will open your eyes to the less fortunate of Istanbul’s strays. Catfights in the dead of night are quite common and there are problems with the sheer volume of the strays in town (unless they are spayed they will, of course, beget more cats). Furthermore, until 2004 there was no formal animal welfare law in place, and even with the current law (Animal Welfare Act No. 5199) offenders are only subject to fines. And as this article about dogs in Istanbul notes, canines are treated with much less affection and care. Curious cat at the Blue Mosque, coming to say hello. In positive news, however, just last month, Turkey introduced a new law that would make it a crime punishable by jail time to mistreat, torture or leave animals without food or water. The law is in its infancy right now, but those interested in supporting it can go and sign this online petition. It will be interesting to see how, if passed, the rule will be enforced. A 2017 documentary about cats in Istanbul, Kedi, aims to showcase a day in the life of a cat in the city. 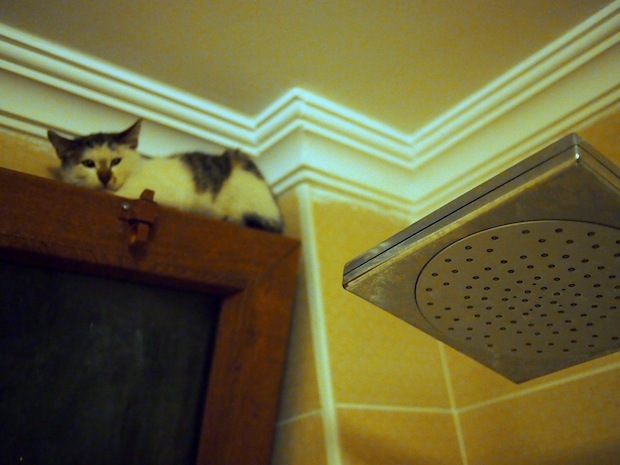 While the film features lovely cinematography and copious cat scenes, it also ends somberly, warning that modernization of Istanbul is pushing out both people and cats as the city expands. Here’s a great writeup from the Paris Review called The Alleycats of Istanbul, both about the film and our love of animals. As for my trip, I met, petted and cuddled with many a cat during my weeks in Istanbul. As a celiac, I can’t eat wheat flour and breads in Turkey (and thus kepab sandwiches and shwarma sandwiches) were off limits. But the platters of meat were giant-sized and I couldn’t finish them off. Trying to communicate my allergy was laughably impossible, so I would instead order the sandwich, grab a fork – to the confusion of the restaurant’s staff – and eat only the meat and vegetables. But what to do with the meat-soaked bread? Why, give it to the cats, of course! Cats and bread: not the best combination. 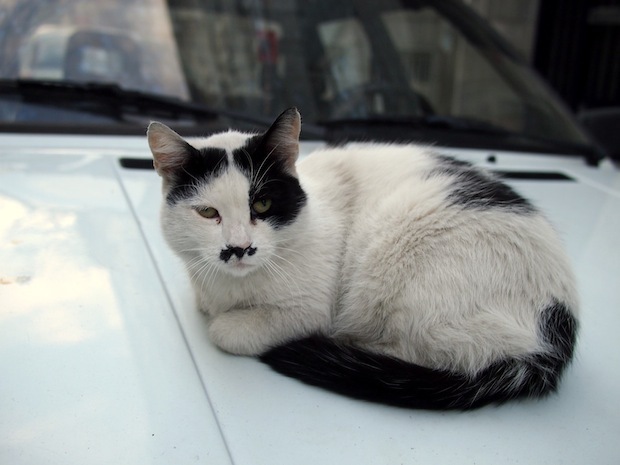 From cats that look like dictators…..
Not the friendliest-looking of cats. 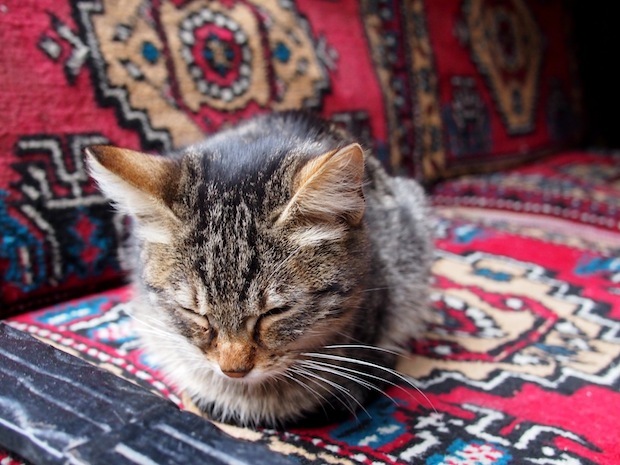 …to adorable kittens in boxes around town, the history of Istanbul is not complete without considering a feline presence and they are firmly wrapped up in my memories of the city. Kepab cats in a box, the back view. 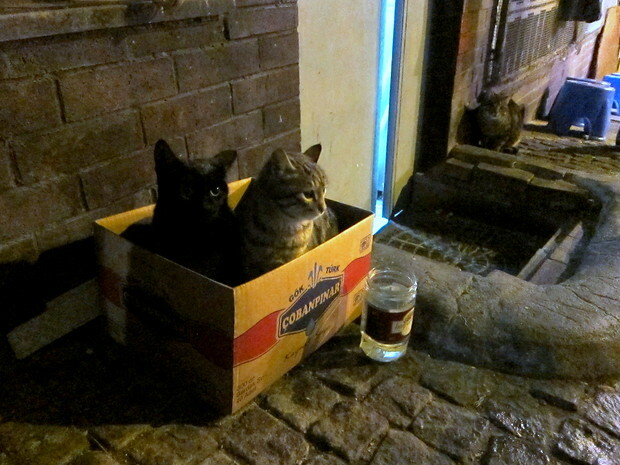 These guys sat there each day, with the box safely stored at night and repositioned every morning. 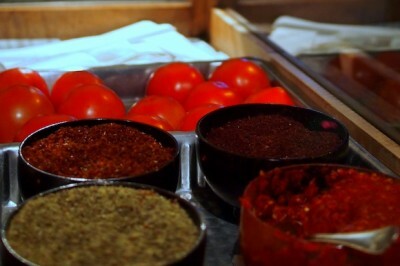 If you’re heading to Istanbul, this 2019 guide from Roads and Kingdoms is a great place to start, and then follow it up with a stomach-grumbling list of top foods to eat in town from Migrationology. Some of my colleagues do not hesitate to tell such city legends or stories about cats-in this case- which helps this misconception to grow further. Please do not forget that Istanbul has the most religious population only for the last 30-40 years. Never before was such as dense distribution. Just remember the Rums, Greeks, Armenians, all other minorities, they all loved and fed cats along with us. If you have been to Athens, you will be surprised to see so much dogs and cats on the streets. As I personally lived in Italy for a considerable time, I may say that all the missing cats in “centro” would meet you as you go to suburbs and small villages. Lovely post. 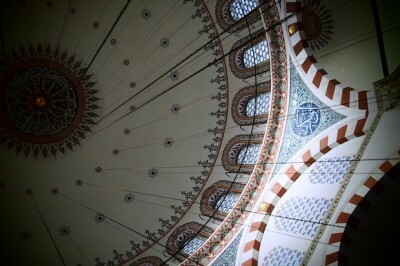 Just came back from Istanbul several days ago. Very similar experience with the cats. 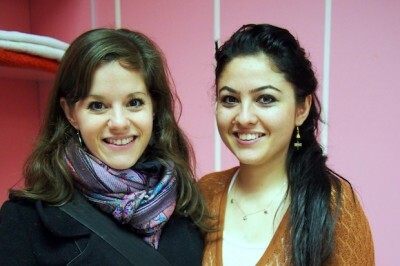 Thanks for sharing this story Sadaf! Appreciate your input. I think the main reason why the people in the City are so friendly to cats is that they keep the vermin population down, especially near the restaurants. A great article and some information. I was in Istanbul in February. While I loved the city as whole and all of its sights, the feline community almost diverted my attention. Many times, in various locations in the city I encountered cats. Some were quite personable and seemed to be very aware of the tourist trade. For me they became a revered part of Istanbul. Very nice article. I remember Istanbul from visiting many years ago. I was so impressed with the friendliness & kindness of the people…how nice to know it also extends to feline residents as well. As a istanbulites :) as a cat lover and as a religius man i want to write about this phenemenon. Firstly there is a lot of story in islamic litarature about cats , dogs and other animals. (If you want to learn i can share) But cats have always diffirent place from the others. In islamic tradition you may feed a cat in your home even you and your cat may eat meal in same dish. Because cats known totaly clean animal(every single moment they clean themselves) . On the other hand we do not say the same things about dogs. Religius persons may only feed a dog in a garden if they need. Even most of religius person don’t touch dogs (because of uncleanliness) . Also cats have a bad name called in turkey. generally people who don’t like cats called them “thankless” and we say them cats are only thankful to god. I am in Istanbul now and love seeing all the cats. When I returned to the hotel from my outing last night the doorman was petting a very contented looking black and white cat. I bent down to pet him also and the doorman asked me to put my hands together, almost as if clapping which I did. The cat stood on his hind legs and putting his front paws out kind of did a little beckon movement. I petted his head and he immediately began to nuzzle my legs. I told the doorman I was sorry I didn’t have a reward for him, I wish I had some food. He laughed as another doorman walked up and together they said not to worry; he just ate and is well fed. And to be honest, I could tell. It made the perfect end for the perfect day. I too, just got back from Istanbul. I loved your article and the comments as well. I plan to return to Istanbul, not for the touristic sites this time, but for the cats. I’m amazed to see strays who clearly trust people so much. On the other hand, I’ve read about the work of some people who care for the wounded and diseased ones, and I’ve read of the tragic history of Istanbul’s dogs, and I feel deeply concerned for them. Also, how is it possible that all these stray dogs could be pushed away to the forrests outside the capital to fend for themselves without human help? This is a strange place with a marvellous exchange between cats and humans, but there are also a lot of animal abusers, and people who keep dogs on leashes in their gardens without ever taking them for a walk or paying them any attention. Cats and dogs all are God’s creations. I to am a big time animal lover…especially cats. The problem with this kind of reverence for an animal is that instead of being appreciated and respected for the animal that they are, no more and no less, they are connected, (or disconnected, as is the case of dogs in the Muslim faith), to some either very good or very bad aspect of the religion. 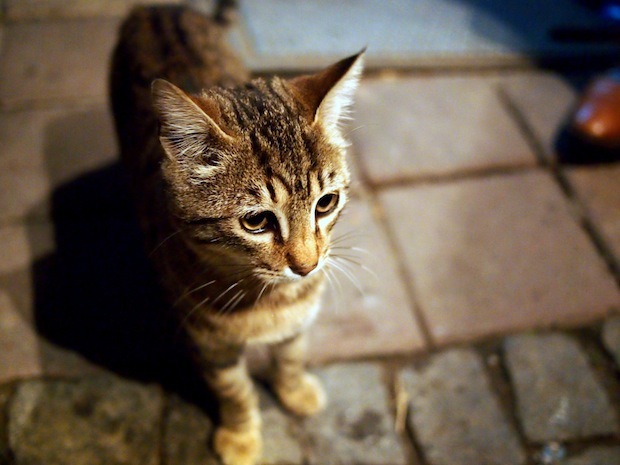 Cats were the favorite of Muhammed, and dogs are seen as filthy, which translates to either the masses treating these animals too well…as is the case when you feed stray cats without vaccinating spaying and neutering them to the point that they become a nuisance to humans and and a health hazard to each other. Or, treating them horribly…as dogs are treated in most Muslim countries. Lets treat ALL animals with respect…this way we can care for our strays responsibly, keeping the populations in check so they are loved by everyone. We arrived in Istanbul this morning and like the rest of you, I was amazed to see so many cats. So many! I was near Izmir last October so I know that cats are treated well (I too have a lovely story from when we ordered fish at a restaurant in Kusadasi and asked if we could share with the cats…the server laughed and said “of course! He needs to eat too!”) we also saw many well fed dogs in that area but certainly not in Istanbul – they are scrawny and clearly unloved. I think I will get a bag of food tomorrow so my children can enjoy feeding the lovely city cats here in Istanbul :). What a city of friendly people. We had so many people offer to help us today as we lugged children and suitcases from airport to tram to Taksim. A Syrian lad was especially kind and offered so many tips and suggestions whilst we sat on the tram. Love these people. I loved visiting Turkey (which I did many years ago, before 9/11) and would love to go back but for all the turmoil in the Middle East. 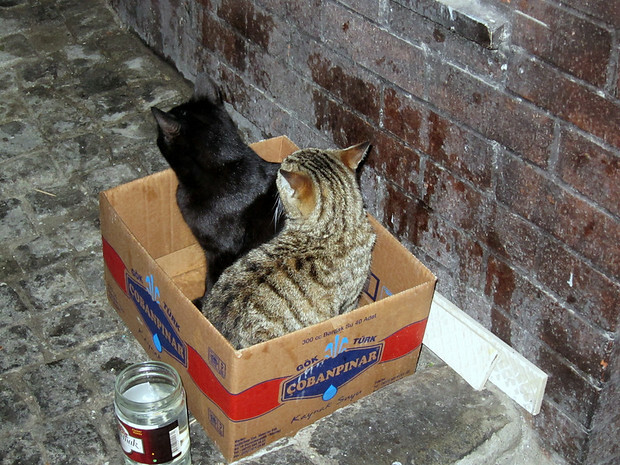 When I was there I also made an effort to bring a little food for the street cats. Some of them have interesting patterns different from the typical cats here, and I would have loved to bring one back with me. I wish they were better protected, though. I like your article about the cats in Istanbul, as I’m married to a Turkish man I have been living here in Istanbul for 2 years, and I want to add that not only the cats are being taken care of in Istanbul also dogs, but the cats are more common inside the city, while you can find more dogs in the suburbs they are all very friendly living side by side with the people, where they find care from the locals and the government. I wanted to send you some photos for the dogs in my area , but I couldn’t add them here. Thanks Jan! 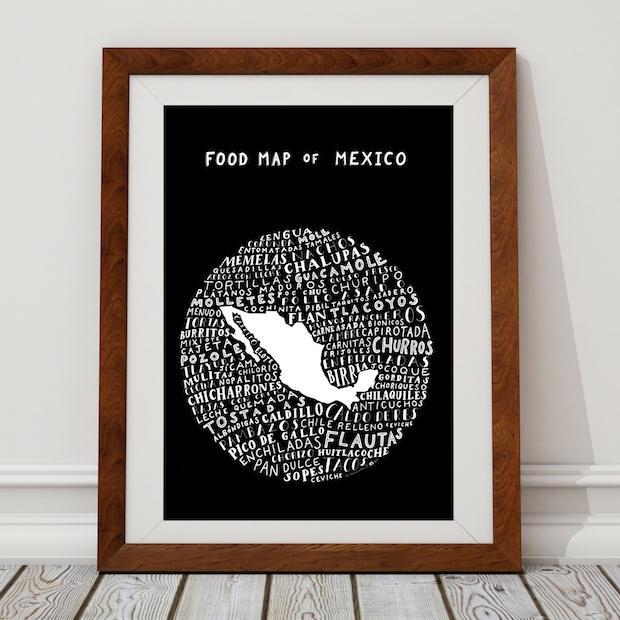 You can’t add photos here but you can send to me at jodi @ Legalnomads .com if you’d like! I’d happily see animal photos from Turkey :) Thanks for the comment! While I can see you are very passionate about this topic, it is unfair to say that I ought to do research when several external pieces are cited in this post. If you have articles that disagree with this, by all means add them to your comment. This piece was the result of discussions with Turkish friends, reading articles and books, and of course my own very many photos of cats. Like you, I always hope that animals are treated well regardless of the breed or kind. Happy to read other articles you might have! ironically, the districts where cats are being taken care of the best are mostly the least religious ones… the islam thing might be true in your case, but istanbul is the only city with such a massive cat population in turkey, let alone other countries with muslim majorities. all the people in my social circle are either irreligious or non-practising muslims, but almost all of them are also obsessed with cats, how about that? the love towards cats in istanbul is cultural thing and has very little to do with religion. and jodi, i respect your views and appreciate your work but as far as i can see, most-if not all- pictures were taken in rather conservative areas of istanbul in the old town. if you happen to visit istanbul again, you may wanna see districts like kadıköy(especially moda and fenerbahçe), cihangir, bebek, ortaköy, arnavutköy(the one in bosphorus) etc. and then you’ll see that it’s not about islam but culture. Hi Toprak, thank you for the comment. 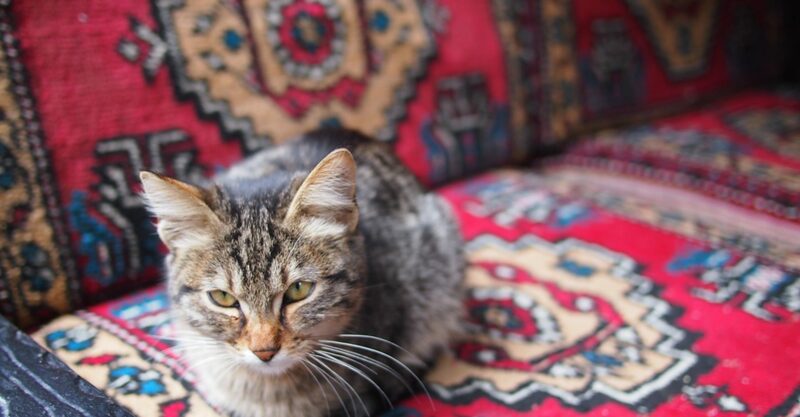 I have been to those districts of course — I spent over a month in Istanbul alone, and it would be quite a limited month if I simply stuck to Sultanahmet ;) I was not suggesting that only Muslims care for cats — of course that is not the case, as cat lovers around the world demonstrate handily. I wanted simply to discuss an aspect of the cat situation in the city that my readers might not have thought about. I lived in Istanbul for 5 months and am aware of the enormous amount of street cats. 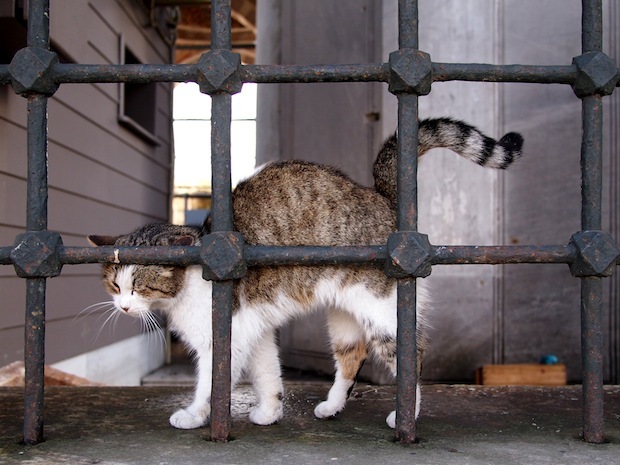 Although the community do feed the cats, it is still an issue. I never found out, but in your time there did the question of ‘where these cats go in winter’ ever come up? Without a warm place wouldn’t a lot of these street cats freeze to death in the snow? Hi Kelly, I’m not aware of where they go but I was there in the late fall and they were outdoors still. I suspect there is nowhere for them to be offered shelter and, like many cities, they take it where they find it. They go warm places like other livings. They go metro stations, they go apartments shared areas. Some people repel them, some not. and, they are clever. They look for warm places and memorise there, and use theres in next times. My wife and I have visited Istanbul twice and found the people to be so friendly and helpful, we just love them and all those lovely cats are so friendly, we had one little kitty that kept jumping on our lap near the Sophia Hagia mosque and was almost begging to be helped, we always get a large bag of cat food when we arrive and spend days just looking for the less fortunate kitty’s and make sure they get food and clean water, but this one little fellow would always run to us when we called, so finally we took him to our hotel, and he stayed with us for 3 days, I went to the pet store and got a tray and some litter and put it in the bathroom, he used it without any training and never made a mess. The hotel staff were s o kind and allowed our “extra” resident, then we finally got the veterinarian to give him the need injections, and he came back to Canada with us ! Now he is a healthy loveable companion which we subsequently found is an Egyptian Mau, and he is the cleanest, and most amazingly intelligent cat we have ever had, and is so loyal and very much loved. We had no problem with the Vancouver authorities as long as he had a certificate to prove the various injections had been administered. So now he is a Canadian Egyptian Mau named “Bobo” . Just love Istanbul and all the cats – our favorite city. Hello, thank you for the lovely comments. I’m happy to hear about your lasting souvenir from the city! Good to know that it was possible to bring him back, and enjoy your time with Bobo! Istanbul is not the capital of Turkey. The title is “why are there so many cats in Istanbul”?? My wife and I are planning a trip to Istanbul. 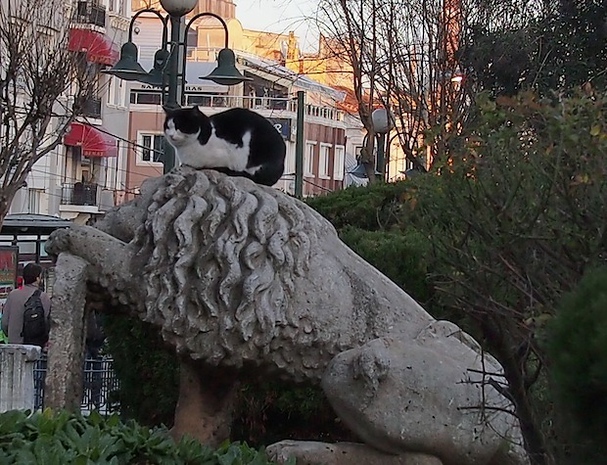 We both love cats, so I wanted to know which particular area of Istanbul has a lot of cats. We want to get a hotel right by it. I heard of an area called Cihangir. Is the cat environment similar to it around the blue mosque or near the grand Bazar? I live in a different city of Turkey. Once I visited İstanbul, I was having breakfast in a coffeeshop. A cat jumped onto a chair near me. Later I found out that it had given birth to a number of babies on that chair safely among people. She was feeling so safe for her babies among people so she came there for giving birth and was completely comfortable with us holding the babies. It was a lovely scene. As a director for a nonprofit TNR group I am always looking for ways to inform the public about cats so we can help them live better lives. Kedi is playing in our town right now unfortunately not yet a big success. I loved this movie. I felt the corners of my mouth go up all the time and could totally relate to the state of worship for cats evident among these Turks who cared for them. What a comfort to know cats are respected.